At the laundromat this weekend, I met a man who’s been living in his car for the past year. 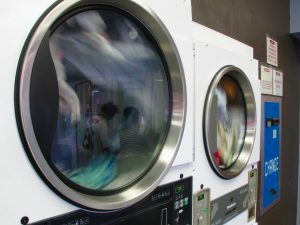 As we both stared at our clothes whirling in the dryers, he said he was quite content and had all he needed. He also talked at length about the pros and cons of different thermal clothing brands, his days as a hospice care volunteer, and the heroic feats of a park ranger he met along the way, and as he folded the last of his clothes and prepared to leave, he thought to ask me what I did for a living. Upon hearing that I’m a writer, he told me there was a novel I should read — In Search of Lost Time by Marcel Proust. Then he recommended two movies — Children of Paradise by Marcel Carné and Ran by Akira Kurosawa.